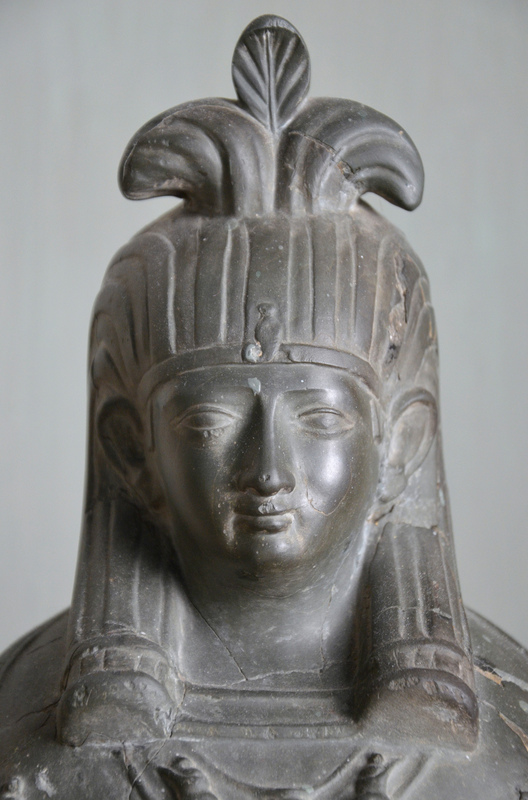 This month’s sculpture from Hadrian’s Villa is a grey basalt Osiris-Canopus jar. The God Osiris-Canopus, from Hadrian’s Villa, 131-138 AD. Vatican Museums (Gregoriano Egizio). 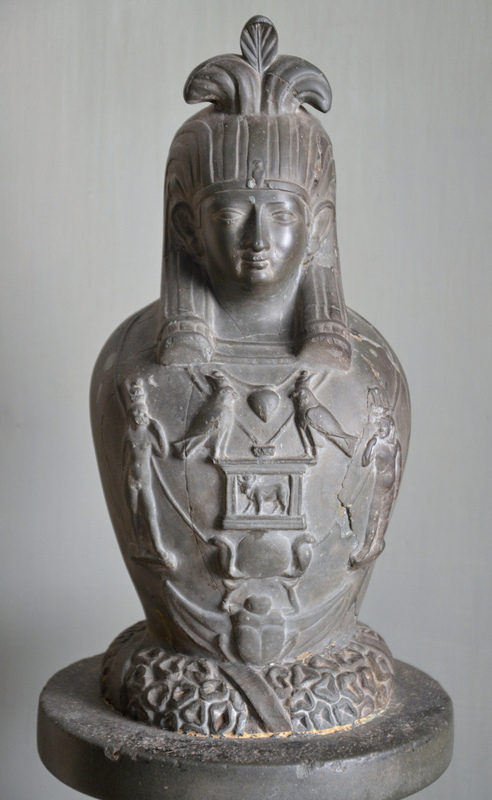 The vase represents a form of the Egyptian god Osiris depicted as a jar topped by a human head known as Osiris-Hydreios, or commonly Osiris-Canopus because it was originally exclusively connected to the Canopic region of Egypt. It was discovered in the middle of the 18th century and is now in the Vatican Museums (Gregoriano Egizio: Vatican inventory no. 22852). It is thought to have come from the Antinoeion, a temple complex devoted to Antinous located along the monumental entrance of Hadrian’s Villa that led to the Vestibule. 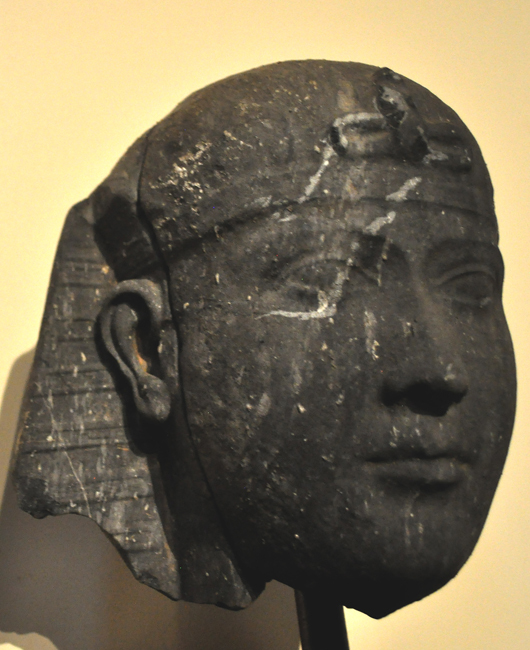 A number of pieces of Egyptian-style sculptures were found at the Antinoeion during the excavations in 2002, including Egyptianizing architectural fragments and a small head with pharaonic headgear (see image here). The lid depicts the head of Osiris. His hair is arranged in the Egyptian style called the klaft. He wears a crown and the protective uraeus (rearing sacred cobra). His body is in the shape of a Canopic jar, a vessel which held the internal organs of the deceased for the afterlife. 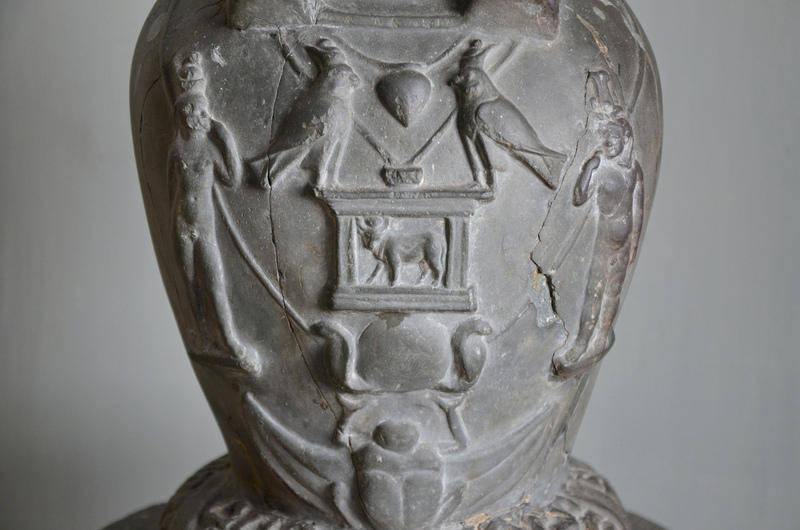 The vase is decorated in relief with a religious scene: a winged scarab beetle is holding the sun disc flanked by two uraei (cobras) and surmounted by a shrine to the god Apis bull crowned by two falcons wearing the double crown of Egypt. The whole scene is flanked by representations of Harpocrates. Osiris-Canopus was named after the ancient Egyptian town of Canopus, located in the Nile Delta not far from Alexandria. The imagery of Osiris-Canopus appears on Alexandrian coins in the 1st century AD and thrived in the 2nd century AD in Egypt and beyond. Representations of Osiris-Canopus are also known from Rome and Pompeii where he was closely associated with the cult of the Goddess Isis. Anne Roulle, The Egyptian and Egyptianizing Monuments of Imperial Rome, 1972, pp.98-100. Frank Goddio and Aurélia Masson-Berghoff, Sunken cities: Egypt’s lost worlds, 2016, pp.133, 236-237.